I had heard that Erasmus of Rotterdam (1466-1536) wrote a book showing hundreds of ways to say “thanks for your letter,” so I went and looked it up, just to see what one of the Renaissance’s prime movers was thinking when he did that. The book in question –originally published as De duplici copia verborum ac rerum Commentarii duo, and available in English in volume 24 of his Collected Works as Copia: Foundations of the Abundant Style (translated and annotated by Betty I. Knott)– is much more than a stunt. It’s a really helpful exercise in developing a style that is rich and full. Generations of readers have known this: De Copia was used as a textbook for rhetoric and composition throughout northern Europe in Erasmus’ lifetime. It was popular enough to be pirated, to give rise to summaries, to be circulated in the form of excerpts, and to spawn commentaries. De Copia is a book designed to help form the capacity for abundance. 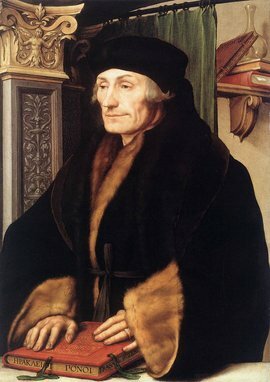 Erasmus assumes that his task as a teacher is to coax students into unfolding and elaborating on ideas, not to criticize and curtail their thoughts. In fact, he would rather see too much fullness than not enough: “I am giving instructions for the young in whom Quintillian was quite content to see an over-exuberant style, because the excessive growth can easily be cut back by criticism and the passing years will wear down other excrescences, while it is quite impossible to do anything to improve a thin and poverty-stricken style.” (p. 300) Critical cutting-back can wait; without the burst of verbal flourishing, nothing can happen. For this reason, de Copia itself is an exercise book, and Erasmus makes sure his readers know that he is “not prescribing how one ought to write or speak, but merely indicating what is useful for practice, and everybody knows that in practicing everything must be exaggerated.” (p. 299) In other words, don’t try this in public! This is the context in which Erasmus sets out his celebrated list of ways to say “thanks for writing.” The actual sentence he transforms, to “see how far we can go in transforming the basic expression into a Protean variety of shapes” (p. 348), is this: Your letter pleased me mightily. tuae litterae me magnopere delectarunt. Some of the variations work better in Latin, and you’ll hear various reports of how many different ways Erasmus produces here. In the Collected Works edition I consulted, the list runs from page 348 to 354, and I count about 150 variations (the edition published in 1512 printed the list with numbers, from i to cxlvi). Your brief note refreshed my spirits in no small measure. I was in no small measure refreshed in spirit by your grace’s hand. From your affectionate letter I received unbelievable pleasure. Your pages engendered in me an unfamiliar delight. I conceived a wonderful delight from your pages. Your lines conveyed to me the greatest joy. The greatest joy was brought to me by your lines. We derived great delight from your excellency’s letter. From my dear Faustus’ letter I derived much delight. In these Faustine letters I found a wonderful kind of delectation. At your words a delight of no ordinary kind came over me. I was singularly delighted by your epistle. To be sure your letter delighted my spirits! Your brief missive flooded me with inexpressible Joy. As a result of your letter, I was suffused by an unfamiliar gladness. Your communication poured vials of joy on my head. Your epistle afforded me no small delight. The perusal of your letter charmed my mind with singular delight. And so on. And on and on! Much of what Erasmus teaches in the Copia would need to be updated before being applied to modern education in rhetoric and composition, but he is fundamentally right about the need for speakers to find the fullness of their powers of expression. The power of speech is indeed magnificent when it rushes on like a mighty stream! Call to mind the most powerful writing you’ve read, and you’ll likely remember wondering how the author found such ways of speaking. There is a mighty mystery in the abundant style.